It’s a slow year for 2018 ballpark changes across the nation, but that’s ok, I’m happy with stability in the stadium world. In all of Major and Minor League baseball, we’ll find just one new ballpark. 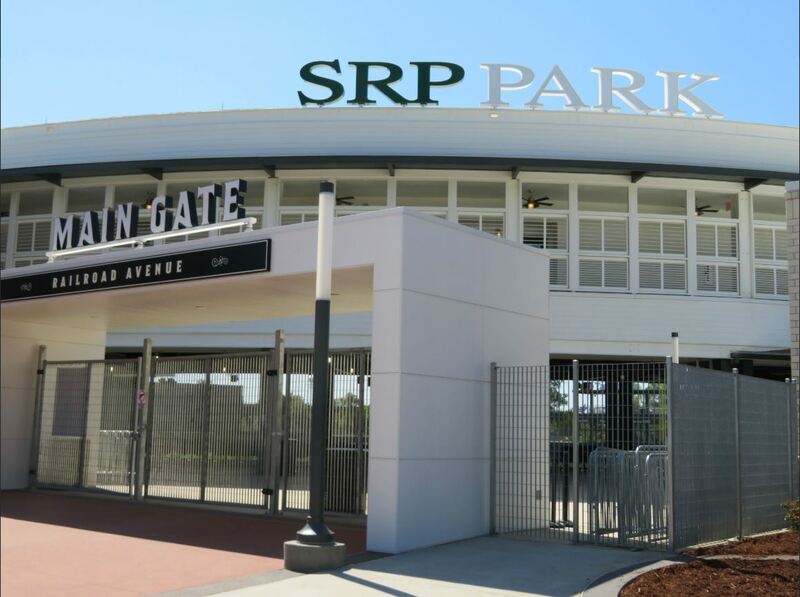 In Augusta, Georgia well, technically North Augusta, South Carolina on the other side of the Savannah River, SRP Park opens a new era for the GreenJackets. This new park is certainly a major upgrade and it has been warmly received by locals. They leave their former home, Lake Olmstead Stadium, a mere 22 years after debuting there. Thankfully, it remains alive as Augusta University will use it during their season. The Independent Leagues have a few notable changes, including the debut of the Chicago Dogs in the American Association. First, I love that logo! I don’t think any city uses their flag more than the Windy City. Secondly, would you believe yet another sports facility is arriving in Chicago? It is amazing how many they now have. Mere months after Wintrust Arena opened, we see Chicagoland open its 6th ballpark. This one is in Rosemont and it is called Impact Field. Over in the Atlantic League, we mourn the loss of the Bridgeport Bluefish, yet another casualty of the 1990s explosion of Indy ball along the I-95 corridor. The reason for this one is that the city decided to turn the Ballpark at Harbor Yard into an outdoor concert venue (angering the arena next door in the process). That’s too bad for baseball and ballpark fans. Although, Harbor Yard didn’t rate too well in my rankings as the experience there was 46th out of 57 ballparks. In NCAA baseball, the for-profit Grand Canyon University continues their facility explosion. Baseball unveiled the rebuilt Brazell Stadium. Now called GCU Stadium, they have an amazing 3,500-seat place for ballgames. I don’t know how the money flow works, but their facilities are certainly a growin’. Elsewhere, Boston College quietly opened Bright Campus Baseball Field as I guess they needed something to look acceptable to their ACC cohorts. Down in the SEC, where they are absolutely dominating the world of College Baseball, the two Mississippi schools are in the process of getting ballpark work done. By the way, this week, conference tournaments are going on. My picks for places to go: the Hoover Met, for high-quality baseball and a stadium that only is alive during the SEC Tournament. Durham Bulls Athletic Park for the ACC Tournament, because I just went there and the city and stadium are fantastic (review will be finished in a few days). And MGM Park for the C-USA Tournament, because it’s another great place and Southern Miss fans rock that park.